Been playing around with Google Scholar‘s Citations system that allows anyone to create a mini page with their publications. Here is a link to mine: Jonathan Eisen. I recommend that everyone out there who has any publications create a Scholar Citations page for themselves. Instructions can be found here. Yet there are many other things I wish were there. For example, I really wish the “Institution” part was an active link and led to other people at UC Davis. Alas, not so. 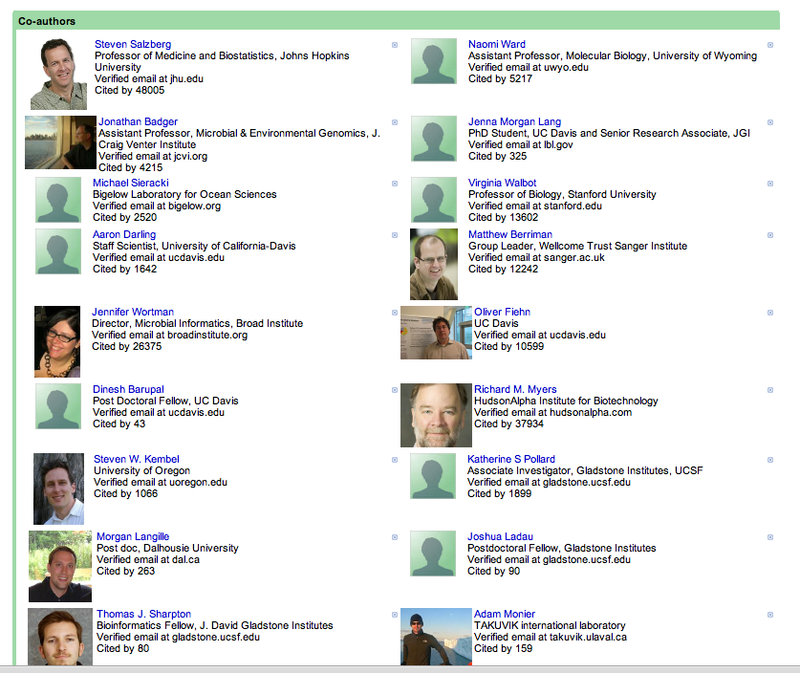 So I had to use the search function to pull out other people from UC Davis (searching for UC Davis in the search for Authors in the box in the upper right from my home page). It would be nice if it had a way to display the whole list not just their top suggestions. But there is no way to see the next page and the only way to see other suggestions is to delete some of them. I know – not everyone will have this issue but at least some other genomics focused folks probably will/do. Anyway – it is worth playing around with – a good addition to the relatively simplistic Google Scholar search tools. Author Jonathan EisenPosted on March 4, 2012 April 10, 2017 Categories Misc.Tags Misc. Next Next post: Yes, Virginia, Cell Phones Have Bacteria on Them … And this means??? ?